Raza-ur-Rehman, president of Quetta Press Club, confirmed to Freedom Network [FN], Pakistan’s first media watchdog organization, on Saturday (February 14, 2014) receiving the letter and denying the charge made against the three photojournalists and a cameraman. “What has been said about the four journalists has been untrue. There is no truth whatsoever in the claim,” he went on to add. A case was registered against the group which was heard first time hurling threat against the media in Balochistan where media and its practioners are under attack from all sides. “No matter if the group is little known, but the threat should be taken seriously,” FN said in its press freedom alert on Saturday (February 14, 2015), adding that the provincial government of Chief Minister Dr Abdul Malick in Quetta should move quickly to ensure the group had not harmed any journalist named in the letter or any other member of Quetta Press Club. The group claimed its members would strike at the club if the four journalists were not expelled. “Get these men out of press club by yourself. By not doing so, the press club will be responsible for the consequences.” The letter, written in Urdu, warned. Raza-ur-Rehman stepped up security at the club bringing the letter into the relevant authorities’ notice and getting a case registered against the group in a local police station. “I have asked for installing CCTV cameras around the club, increasing police strength and documenting every visitor to the club,” he listed some of the measures he has taken to thwart the threat. On December 22, 2009, a suicide bomber attacked the Peshawar Press Club to target senior journalist Shamim Shahid. He remained unhurt in the attack, which left three dead and 23 injured. 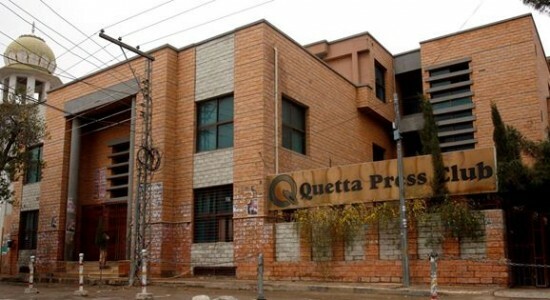 “One of the photojournalists who was named to be expelled is working more than 30 years and there has been no such allegation against him ever,” said one of the Quetta Press Club members speaking on condition of anonymity. “We have not heard of this group before. However, we cannot take the threat lightly and that is why security has been increased at the Press Club,” he went on to add.